Earlier this month the Google Open Source Programs office welcomed eight* of the ten Grand Prize winners of the Google Code-in 2011 contest, a contest designed to introduce pre-university students (age 13-17) to the many ways they can contribute to open source software development. There were 18 open source mentoring organizations that the students were able to work with on a variety of tasks. Tasks included everything from writing and refactoring code to providing documentation for the organizations to outreach and marketing to quality assurance testing. 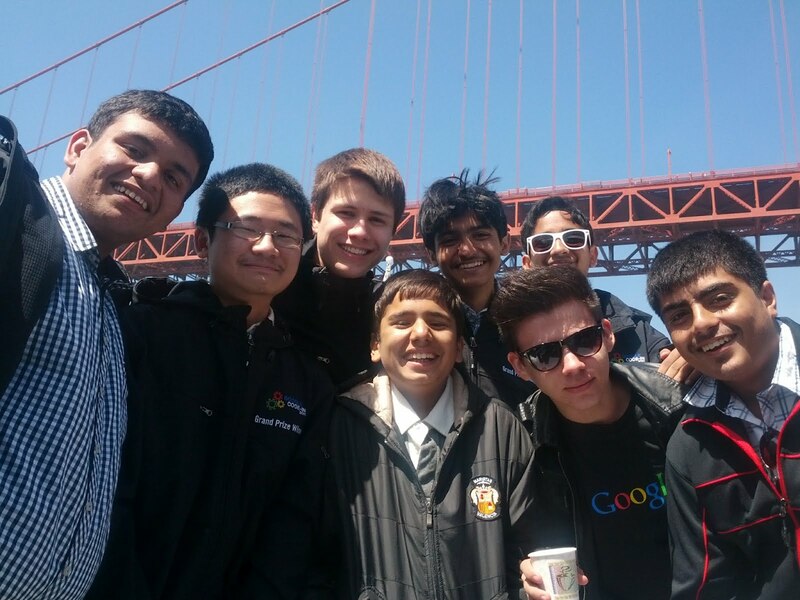 Students earned points for each task they successfully completed and the 10 students with the highest number of points at the end of the contest won a trip for themselves and a parent or guardian to the Googleplex in Mountain View, California for four nights. The week started off with a meet and greet dinner at the hotel near Google where the students who had spent many hours together in chat finally were able to meet each other. This was also the start to the four day food and swag fest. The evening ended early so everyone could try and get over their jet lag: our attendees flew from Romania, India, Canada and the northern midwest of the USA. The next morning started off at the Googleplex with a discussion on the history of the Google Code-in program and a bit about the goals of the program. Next, Carol Smith chatted about the Google Summer of Code program for university students, a natural next step for many of the students heading off for college in the next year or two. The morning concluded with Chris DiBona, Open Source Programs Director at Google, leading an awards ceremony for the students where they received their plaques and certificates showing their achievements as grand prize winners. We were excited to welcome back one student for his second awards ceremony for Google Code-in as he was a grand prize winner in 2010 and 2011. Chris wrapped up the morning session with a discussion on open source at Google and capped his talk off with a few pointers for the students and parents on how to successfully ride a segway for their adventures the next day. After a tour around the Google campus with a stop at the popular Android building with its fun Android release statues, the group loaded up on lunch at Google’s largest cafe. After lunch, the group headed over to the Computer History Museum just down the street for a docent led tour. There was so much to see the hour long tour wasn’t nearly enough time to absorb the magnitude of the contributions made by the pioneers in the computer science industry over the decades. Back at Google, there were more members of the Open Source Programs Office awaiting our arrival, including Shawn Pearce who gave a talk on Gerrit Code review. Making sure the students didn’t fall into a late afternoon stupor, Jeremy Allison engaged the group in an interactive tutorial on how to design a file server. David McLaughlin, Global Programs Lead for Google’s Developer Relations team discussed how there are many paths for software engineers to take in their careers including becoming developer advocates. Next Tiffany Montague (with perhaps the coolest title at Google - ‘Intergalactic Federation King Almighty and Commander of the Universe’) discussed the Google Lunar X Prize and the many exciting things going on with the private sector’s race to the moon. Our final speaker of the day, Joshua Bloch, tested the group with a couple of Java Puzzlers and shared an amazing pic from the recent transit of Venus. The busiest and most action filled day of the trip started off bright and early with the first stop a must for every visitor to San Francisco - a trip to the Golden Gate Bridge (which just celebrated its 75th anniversary a few weeks ago), complete with a walk to the first pillar of the bridge and some windy and sunny group shots. Then a quick drive across the Golden Gate Bridge to meet the yacht for a tour of the San Francisco Bay complete with a trip under the Bridge, around Alcatraz and up along the edge of the city. The weather was stunning and perfect for a couple of hours in the sun on the Bay. Next up, a guided segway tour of Golden Gate park, including some exciting off-roading on a few dirt trails. After everyone safely disembarked from their segways, they all boarded onto a motorized cable car and took a two hour tour of the city with stops at Twin Peaks with amazing views of the entire city and then by the Painted Ladies, and through Chinatown and North Beach, ending at Pier 39 on Fisherman’s Wharf. By the time everyone sat down for dinner it was a true test of wills to not do a face-plant into their dinner after the long day of adventures. The final morning of the trip group everyone headed to breakfast at the new cafe in the San Francisco Google office and they received their final swag bags complete with a selection of San Francisco goodies and the favorite swag from the trip - a Samsung Galaxy Android phone. All of us at the Google Open Source Programs Office felt honored to spend a few days with these bright, talented young coders. In conversations with the students we were excited to learn that many had never worked on open source software before they started participating in the Google Code-in contest, so it truly was their introduction to the open source community. 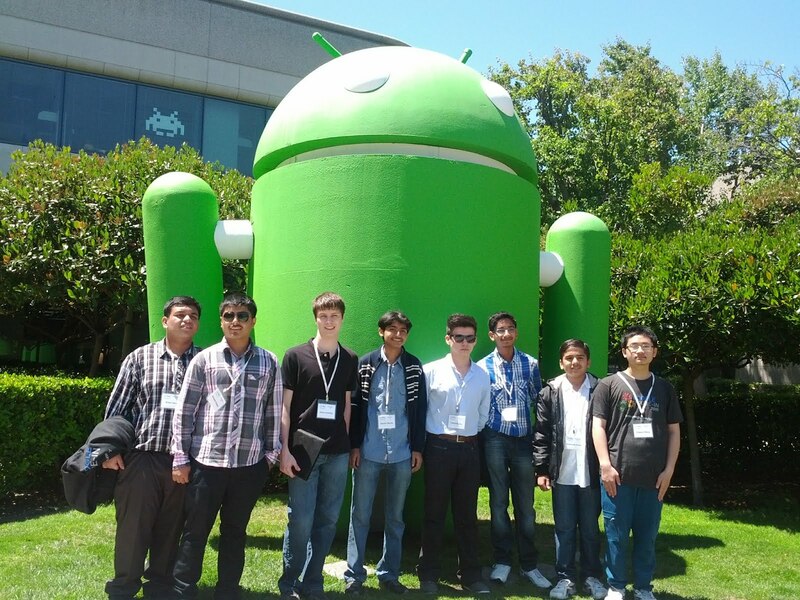 One student is already participating in this year’s Google Summer of Code and another student became a project committer as a result of his Google Code-in experience. 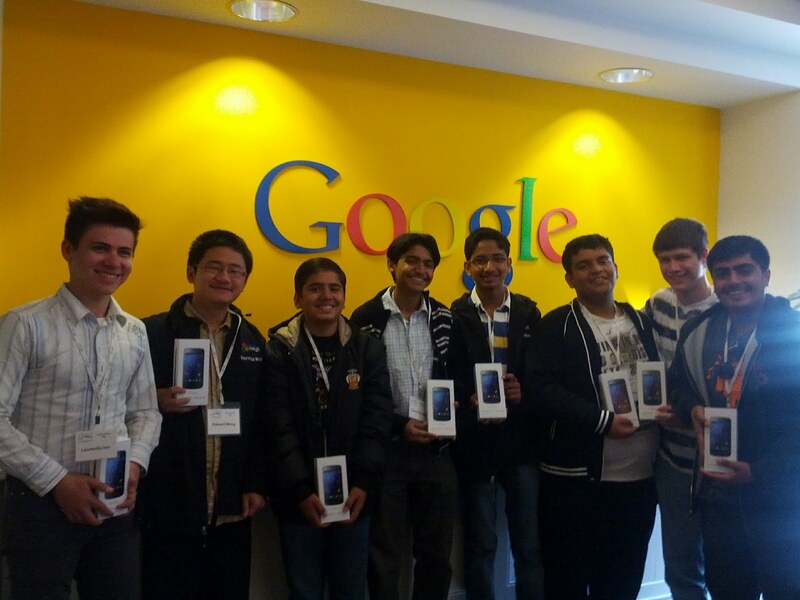 We look forward to seeing these students at future open source events in the years to come. Keep up the amazing work! * We were disappointed that two of the students were unable to make the trip due to mandatory tests in their countries during the scheduled week of the trip.